I am not entirely a bread lover. Given an option I prefer Indian flat breads or rice on any given day. But considering the number of bread recipes I bake, I see myself being a convert, probably soon. Baking them is entirely fun. There's a profound joy in kneading, proofing, watching it rise, punching it down, rise again and bake to golden hues. There's immense satisfaction one gets out of home made bread, the joy only a home baker knows best. This recipe in particular comes from my drafts, long standing in nature that was baked late noon to satisfy the urge to bake bread couple of weeks ago. Clicked late in the evening and hence my dissatisfaction with its photography, it went into hiding for sometime into my drafts. But then that doesn't rule out the fact that this herbed bread is delicious and can jazz up any meal. 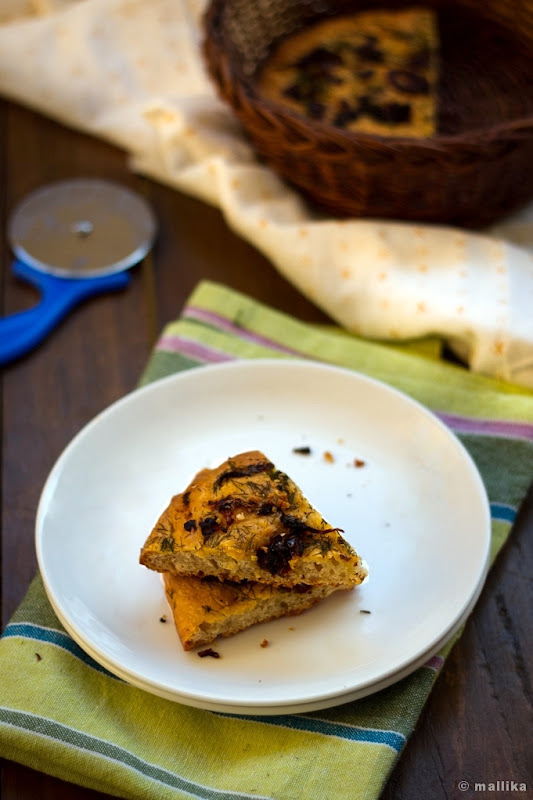 This bread has a nice tang from homemade sun-dried tomatoes and herbed flavors from dill leaves. Pair it with soups, salads or pastas, they'll make a meal complete. Dissolve the yeast in half a cup of warm water and teaspoon of sugar. Stir well and allow it to sit for 10 minutes. By then the yeast will activate and bubble up. Place the flour and salt in a large bowl. Add in the yeast mixture and stir with a wooden spoon to form a dough. Gradually add the remaining water and bring the dough together. Knead it for a 4-5 minutes. Place it in an oiled bowl, cover with a tea towel and place it in a warm place to rise for a 3-4 hours. The dough will rise and double in size. Once risen, give the dough a punch, deflate it and knead it on an oiled surface for five minutes. Place the dough on a baking tray, shape it to your desire and press dimples on top of the bread dough. Mix a tbsp. of olive oil, sun-dried tomatoes, chopped dill leaves and red chilli flakes in a bowl. Top the dimpled bread with this topping, spread it gently and allow the bread dough to sit in a warm place for an hour to rise. Pre-heat the oven to 200 deg C. Bake the bread at 200 deg C for 30 minutes, or till the edges crisp and the bread is golden brown. Beautiful focaccia! I am a huge fan of homemade bread. I just love baking focaccia. It's comforting, not to fussy and we can add whatever flavor we like! What a fantastic combination of flavors here Mallika. The dill sounds exotic. Sounds very delicious..a new recipe for me. 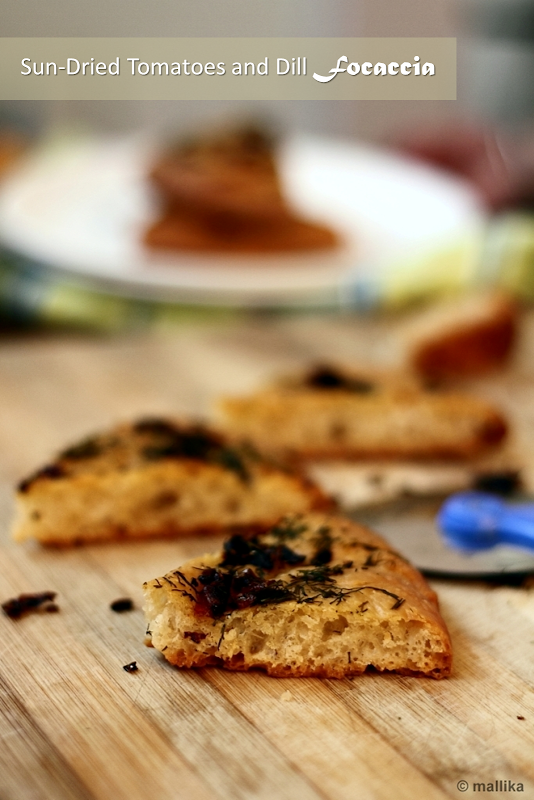 An aromatic focaccia definitely, beautifully baked. Baking bread is a high and more of a joy for the minimal fat you will need to enjoy a good one! Loved the holes in your focaccia..
Hi Mallika, Could you please tell me which oven do you use (brand as well)? Can we bake in Microwave? Focaccia looks lovely.